What Really Drives Capital Growth? What Really Drives Capital Growth? What Really Drives Capital Growth? What really drives capital growth? You’ll be surprised to discover it’s not income, population, vacancy or other figures often stated as causing growth. Learn more about finding areas with a good chance of growth. Get the Advanced Suburb Research course today. What really drives capital growth? When you’re looking at investing in an area, there are a lot of things that people say drive capital growth – population, jobs, income, desirability, proximity to amenities like hospitals and schools or train stations. 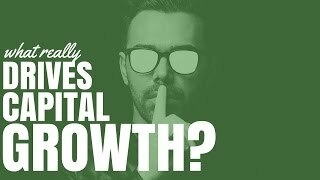 There’s so many things that people say drive capital growth, but what is the real driver of capital growth? Hey, I’m Ryan from onproperty.com.au, helping you find positive cash flow property. This month, we’re talking all about suburb research to announce the launch of my new course, Advanced Suburb Research over at onproperty.com.au/suburb. I think it’s really important for us to consider what actually drives capital growth. So many of us bank our investment strategy on the capital growth that we hope to achieve. Even if we invest in positive cash flow properties, we want some sort of capital growth so we can go on and continue to build our portfolio using the equity that we’ve gained. In order to understand capital growth, we need to understand what really drives capital growth. It’s a really old concept in economics called “supply and demand”. When demand exceeds supply, prices tend to rise. When supply exceeds demand, prices tend to stagnate or decrease. That’s the law of supply and demand – I don’t know if it’s a law but the idea behind the economics – and the same is true for property. When there is huge demand for property in an area, then prices tend to go up. People know that they can sell this property for more money because there’s a bulk of people who want to buy it, and people are willing to pay more to get access to it, and therefore, prices rise. Or, if there’s an are and people want to sell their properties but there’s no one to buy them – let’s say these people really need to sell them – well, they have to lower the price in order to make people interested to buy them. And so, the prices of an area go down. Supply and demand is really important when you’re looking at investing in an area. But demand and supply have different aspects and different drivers in and of themselves. And this is why predicting capital growth can be so difficult. Let’s have a quick look at demand and then we’ll have a look at supply. So, what affects demand? Well, job growth can affect demand. Because if there’s more jobs in the area or more money in an area, more people are likely to want to move to the area – creating more demand. Proximity to amenities can drive demand. If people want to be near a certain school or they want to be near public transport or they want to be near cafes and restaurants or a shopping centre. Those sorts of amenities can drive demand from an area as well. Desirability of an area can drive demand. So, let’s say there’s an area that a lot of rich people live in, that could be a very desirable suburb, just because it’s desirable. So, that can drive demand for the area up to a certain price. You’ve got affordability on the other flip side. Rather than being desirable for the elite, an area could increase in demand because of it’s affordability relative to surrounding suburbs. You’ve got heard mentality, as well. I think we’re seeing a portion of this in Sydney and Melbourne. Prices are going up, up, up. People get fearful and they think I need to buy a property now because prices are going up. And that puts more pressure on the market, which forces more prices to go up, which means more people are fearful and try to get in, increasing demand. And it’s that cyclical thing that is going on. So, there’s that heard mentality that affects demand. There’s infrastructure investment, which can affect demand. So, if the government into an area and invests heavily in that area in a way that creates jobs, then that can create demand in the area. Development can actually create demand for an area. So, there’s a certain portion of people who want to live in new-build houses or development happens in the area, it becomes more desirable. And so, people want to live in that area. There’s also migration, as well. So, people migrating into Australia, might decide to live in certain areas. Or people might be migrating out of Sydney into regional centres or from regional centres into city to try and get a better job. So, there’s migration as well and that affects demand. So, theres a lot of different things that affect the demand of an area. So they all really need to be taken into consideration if we want to understand demand and supply. On the supply side, you’ve got things like development. So, there more properties that are released in an area, the more supply there is for people to live in those properties. This could be in the form of blocks of units, or it could just be a townhouse, or it could be people building granny flats. By increasing the supply, then there’s more choice for people to choose from. And also, renovations – even though they’re not increasing the supply side of things, they are increasing the quality of the supply, which can affect capital growth as well. So, if you’ve got a lot of people in an area – they call it gentrification – where they’re improving the suburb themselves. Then, that can drive up the value of the suburb from the supply side of things because the supply becomes more desirable, which, I guess, increases the demand. So maybe that’s a demand side thing. But you can see there’s a lot of things that drive demand and supply. And it’s a balancing act between the two to understand, how is that going to affect capital growth and how is that going to drive capital growth? Because we don’t have a super computer in the sky that can understand all of these minute things and go scrape through all the job listings on side and access all of our taxation records and understand what people are saying about suburbs to understand the desirability or understand how affordable they are or understand in detail the infrastructure investment and what affect that’s going to have. Because people can’t collect all this data and understand demand and supply, what we look at instead is secondary metrics that kind of indicate demand and supply. So, things like vendor discounting – this is how much a property is sold for compared to its listing price. So, if it’s listed for $1,000,000 and sells for $900,000. That’s a vendor discount of 10%. And so, vendor discounting is an indicator of supply. I was doing research for my Advanced Suburb Research course, one of the areas I was looking at was Cranulla in Sydney. Vendor discount was -0.2% when I was looking at it. This means properties are selling for more than they’re listed for, which is an indicator of high demand for that area. So, rather than looking at the things that drive demand, we’re kind of looking at the demand itself and the effect that demand has on things like vendor discount. Things like vacancy rates or days on market, that sort of stuff. When we’re researching a suburb to try and understand the capital growth, we’re not necessarily looking at the drivers of that capital growth itself. We’re not necessarily looking at the job growth of an area. What new jobs are available? We’re not looking at that sort of stuff. We’re not really looking at things like the heard mentality and how is that affecting things. Or, we’re not necessarily assessing affordability of an area. Though, you can kind of do that if you’re super smart, but what we’re looking at is how demand is affecting prices and days on market and all of this sort of stuff, so we can get an idea of the demand-supply ratio. When it comes to what really drives capital growth, the answer is demand versus supply. When demand is higher than supply, that tends to drive capital growth. You’ve also got things like inflation, as well. Which drives growth because money becomes less valuable. But that’s probably a topic for another day. But that helps to drive growth as well. If you want to understand how to research a suburb, to understand what the demand is like for that suburb and whether it’s likely to grow in the future, then I do have a course on advanced suburb research where I will show you, in detail, exactly the data that you need to collect. It’s not an exorbitant amount of data that’s going to cause you overwhelm. I broke it down, there’s 10 key points and there’s 5 secondary points of data that fit on a one-page checklist. So, I go through and I show you exactly how to collect that data, and it’s all available for free online. Once you go through this course, you’ll be able to collect all this data using nothing but free tools. I show you how to collect this data. And I also go through, in detail, and show you what does the data mean. If a vacancy rate is this figure, what does that mean? And what is the trend of vacancy rates mean? And how do you compare this all together to find the best suburb for you to invest in with the potential for capital growth. And hopefully, an area that’s at low risk of decreasing in value. If you want to learn how to do advanced suburb research, check out my course, go to onproperty,com.au/suburb. And next time someone’s saying to you, oh yeah, income growth causes capital growth in an area. You can be like, yeah, well, no. Supply and demand is what actually affects capital growth. And there’s a LOT of different aspects of demand. A lot different aspects of supply as well. It’s a very difficult thing to understand. So, if someone says to you, this one thing affects capital growth, you can understand it’s actually more complex than that. I hope that this has helped you to understand what really drives capital growth in an area. I’m Ryan McLean. You can check out all my episodes at onproperty.com.au. Or you can check out that course which we talked about at onproperty.com.au/suburb. I hope that you enjoyed this episode. Until next time, stay postive.